Today’s Priority Queue continues our discussions about network modeling and programmability. Our guest Michael Kashin has been working with YANG models, python, and a variety of supporting tools to programmatically install network device configurations, spending time with both Junos and IOS XE. In his detailed series of posts on networkop.co.uk, Michael has painstakingly explored and explained how to work with network models, showing how they tie to the future of network configuration. In this episode, we discuss many of Michael’s discoveries. 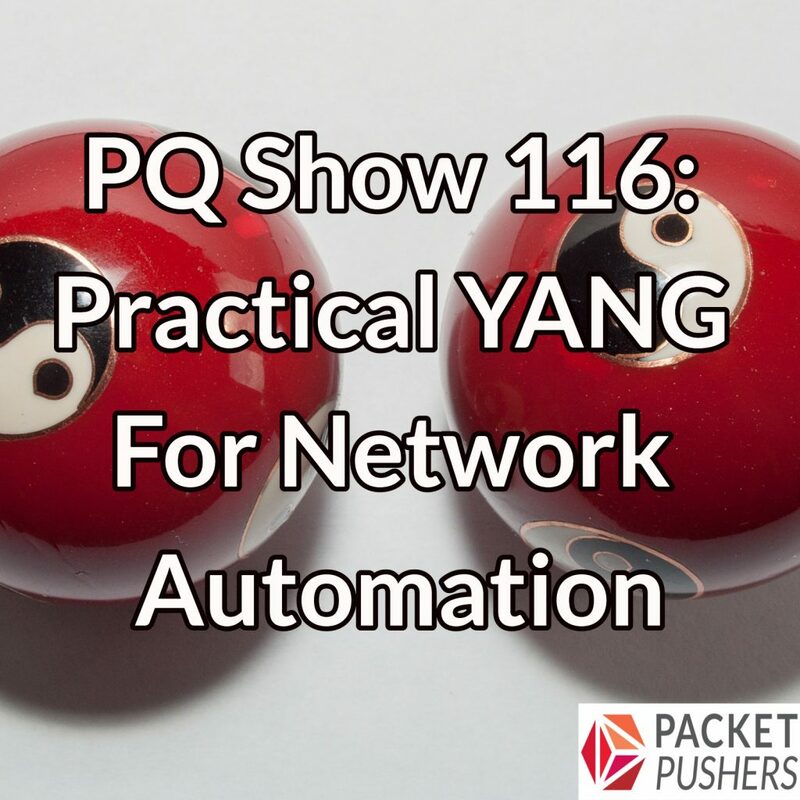 If you skipped it, you might want to listen to Priority Queue episode 111 first, where I discuss YANG, NETCONF, and network model standardization efforts in the IETF with Benoit Claise. That would be a good foundation for today’s episode. We are working wth Cisco NSO (ex-tail-F) and generic devices, and had to translate the podcast content to our use case and our world; mi take is that we work with devices that don’t support Yang by themselves, so we model services in Yang in NSO, as a proxy for the configuration on the device. In that way, the capabilities that the device does not have, since it does no support Yang, we model in NSO and it abstracts the device. We can do netconf with NSO and it will do netconf with the device, if supported, or cli, or specific communication. The pros is flexibility in the modeling of services, the cons is you start from scratch and doing models right is complex, specially if the service is complex. And have to use templates for commands. A lot of work to do , still. Kind Regards, and very nice episode. I am interested in your experience, would you be available for discussion on NSO (tail-f), and if yes could you please share your email/messenger etc?